Enjoy the best dog sledding New York has to offer at various locales throughout the state. 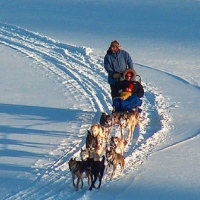 Find all types of outdoor venues that feature dog sledding in NY. Fun Dog Sled Rides in NY! During the snowy winter months, Golden Arrow Lakeside Resort offers fun-filled 10-minute dog sled rides around Mirror Lake. Rides are on a first come first serve basis, so there is no need to reserve ahead of time! Surrender yourself to the beauty of the Adirondack Mountains during your stay at this spectacular resort! Golden Arrow offers a slew of activities all year round. During the summer you can lay on the resort's eco-friendly beach, which is renowned for having the cleanest water around! When you get hungry, grab a seat at the Generations Restaurant--which is now open for breakfast, lunch, and dinner.